There are two favorite rhyming hand games for babies in my family: “My Mother’s Knives and Forks” and “Here is the Church.” I can remember loving them as a young child, and both of my boys love them now. 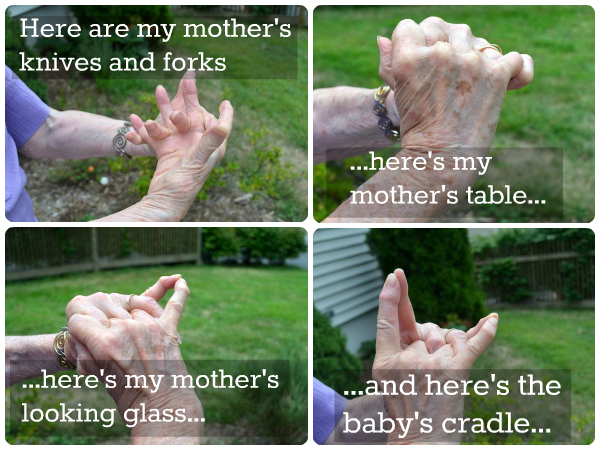 As my grandmother’s hands were the ones that taught these rhymes to me, and passed them to my boys, she graciously agreed to be my hand model for this post. Then rock your “cradle” back and forth singing “rock-a-bye baby, on the tree top…” This is such a favorite that just posing for these pictures, she had to sing the rhyme several times for my 1 year old! 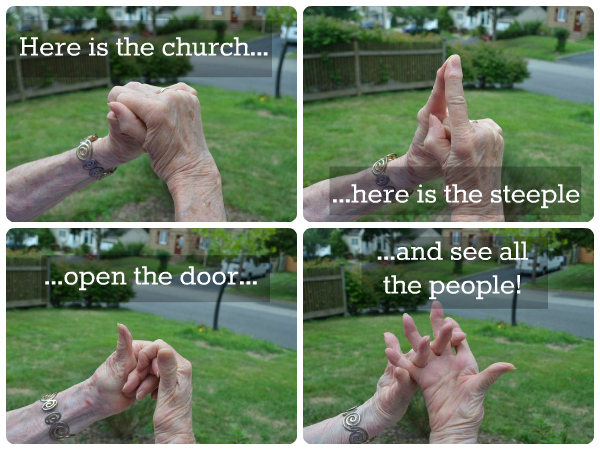 Then wiggle all your “people” around like crazy! Although these are the rhymes we typically do with my baby, my 4 year old always wants to get in on the action, too. This time, he requested that Gimmy make up another rhyme using her hands. She actually did come up with one on the spot, involving a soccer field and a net, but said she would work on a rhyme for the next time she see him. If she does, I’ll be sure to post an update!